THE SKINNY: I am a beach lover! Especially this time of year. 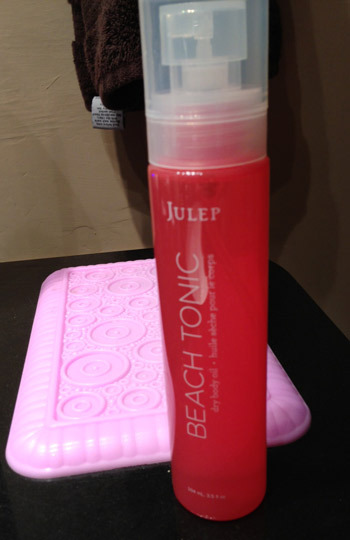 And Julep's Beach Tonic Dry Body Oil reminds me of the ocean waves every time I use it. The light oil mist helps moisturize and nourish skin that is taking a summer beating. The scent is fantastic -- light, beachy and fresh. The formula contains cotton seed oil, which is full of skin super worker Vitamin E.
The mist goes on pretty even but you still need to rub it in with your hands. The oil goes on very dry for a product of this type, but did leave somewhat of a light residue behind (which is why it did not get four stars). I was a little worried that I might leave a mark if I sat on the couch for the first few minutes after application. CHECK IT OUT: Check out the Beach Tonic Dry Body Oil or sign up to become a Julep Maven today -- it's totally worth it!